Bats trigger some very extreme reactions. Many are afraid of them – think vampires in mythology and stories of bats getting tangled in someone’s hair. Others, like me, are fascinated by their ability to fly and catch food on the wing in the dark. I have seen the largest maternal colony of Mexican free-tailed bats emerge at sunset from the Ann W. Richards Congress Street Bridge in Austin, Texas, three times: Once from the water – not recommended for those whose are uncomfortable with bats, and twice from the bank of Towne, now Lady Bird Johnson, Lake. One of those times was under a full moon. It was one of the most impressive things I have ever seen. Bat habitat includes wetlands, fields, forests, cities and suburbs. Bats in Ohio are exclusively insect-eaters and usually hunt in open areas where insects swarm, such as over open water, in forest clearings or farm fields, and around streetlights. Many bats are social and roost in a colony that may be in a cave, under tree bark, in a building. Bats are not blind. Their vision is similar to ours. They hunt in the dark, so they have developed a better way to navigate. They use something called echolocation, a form of sonar. Bats produce high-frequency sounds above our hearing sensitivity. Bats’ ears look strange to us, but they are critical to their ability to move through the dark. This allows bats to locate prey in total darkness, while avoiding hazards. 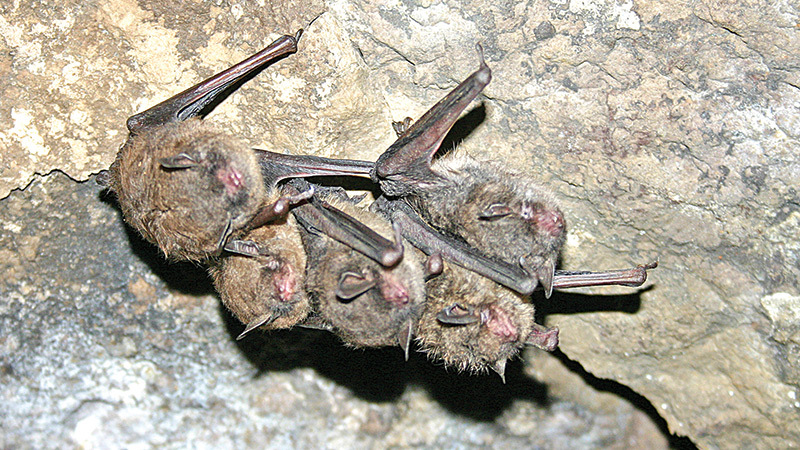 Bats cope with cold weather and the lack of insects in a number of ways. Some migrate to warmer areas where they can find food or to caves where they spend the cold months. Others migrate a shorter distance and hibernate in caves, buildings or hollow trees. During hibernation, the bat’s heart rate and breathing slow. In order to survive hibernation, bats increase fat reserves in late summer and fall. Bats can be roused from hibernation by warm weather or human disturbance. Because they cannot feed during these periods, frequent disturbance can affect their ability to survive. This is one of the reasons white nose syndrome is so lethal. It causes bats to awaken more often and being awake without food depletes their fat reserves and the ability to survive cold weather. As it warms in the spring, the bats will awaken and feed. If it’s warm enough for bats, it’s warm enough for insects. In recent years, bat populations have declined. This is the result of habitat loss, diseases, even vandalism. Bats are very important in our ecosystems. They help control insects by eating up to half their body weight in bugs every night. It may seem like a small amount, but multiply that by the number of bats flying each night, and it adds up to a lot of insects. Join us from 6:30 to 8:30 p.m. Oct. 24 at Mill Creek MetroParks Farm in Canfield to hear bat expert Marne Titchenell share her knowledge of bats in Ohio, her work with bats and bat houses. To read about Titchenell’s work on bats and to see a video, visit go.osu.edu/morebats. For details about our program, visit http://go.osu.edu/bat. March 28, 2011 12:02 a.m.